Now that we are into July I wanted to give you the final update for my 50 dollar a week grocery budget challenge. As a refresher, here are the first two posts (these will each open in a new tab so you don’t lose your place). As you can see it isn’t perfect and I was a little over. I probably could have done better and gotten it under $200 but overall I think we did pretty well. At the end of this post is the 30 day meal plan that we followed. When I started this I didn’t have a month of meals planned but instead planned by the week. 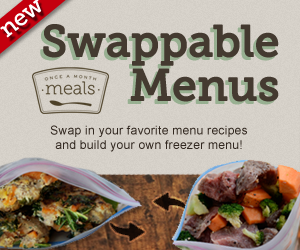 I also tried to incorporate leftovers whenever possible to save both time and money. 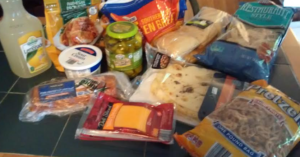 This is one of my weekly Aldi trips, including a large bag of southern style chicken fillets, a large bag of Parmesan crusted chicken and one pork tenderloin. Each week I shopped at Aldi first and then bought the rest of what I needed Wegmans. Some days weren’t balanced but I did try to serve a vegetable into most meals. I will admit though, we could have done better with fruits and vegetables, although we did eat produce at other times during the day, we didn’t eat as much as we normally do. What I didn’t show in the meal plan below were drinks. Normally drinks were water, skim milk or iced tea (I am the only one who drinks it and prefer it unsweetened). We also had 100% juice available most days (usually grape, my son’s favorite) and on occasion, lemonade. Around here breakfasts and lunches are always simple. We usually have cereal or oatmeal for breakfast and some sort of sandwich and fruit for lunch (usually peanut butter and jelly). Then we look forward to a bigger meal at dinner. Snacks are usually fruit, cheese sticks, pretzels, and for sweets, ice cream or cookies. I would like to say that I did a lot of baking but I only baked a few times. The Aldi’s cookies are pretty cheap and really good, although my son would prefer I buy real Oreos instead of generic. I know I should bake more because prepackaged snacks really aren’t healthy. I still believe that everything in moderation is okay for most people but doing more baking, with ingredients that I can control is my ultimate goal. All in all I do feel that the plan was a success, since it allowed me to be creative with meal planning and also start cleaning out my freezer and pantry. And keep in mind that our groceries included all items, not just food. I had to include paper and cleaning products (although I was stocked up on some of those items before the challenge) as well as dog food. After making it on an average of $50 a week for the entire month of June I feel confident that $75 a week will be more than enough to include everything we need. I will also be able to increase fresh produce. It also helps that in a few weeks our garden will be ready and we will have plenty of fresh produce. I will use that opportunity to stock up on other items since I won’t need to buy much produce over the summer. This plan also got me to think outside the box when it came to meal planning. It forced me to use up what we had instead of just going to the store and buying whatever sounded good. Here is our menu for the month of June, and yes there is a takeout pizza toward the end of the month. I had a meal planned for that day, but when an appointment took three hours longer than expected and we were all starving I caved. On June 1st and June 3rd it was just my husband and I so I kept things simple. Pork tenderloin, baked potatoes, red wine vinegar coleslaw. Parmesan crusted chicken, side of spaghetti with meat sauce (sauce frozen from previous meal, there wasn’t enough for main dish so I served as a side). I know this challenge isn’t perfect. On one hand, I had to include non-food items, which was hard to fit in at times, but on the other hand, I wasn’t starting with an empty freezer or pantry. All in all this has been a great learning experience which forced me to be more creative with meals. It also allowed me to clean out my big freezer and opened my eyes to how easy it is to waste food. Most of the food in the freezer was okay to eat but some I did have to toss. I am going to make it a point to start dating food that I freeze and get better about rotating food by date. I know that not everyone has access to an Aldi but if you do I highly suggest you give them a chance. Every week I find new products that I just love (and are often better than the name brand versions) and I can’t get over just how much I save just by taking my shopping list and going there first. Even if you don’t have an Aldi you can still save money. Just keep watching the deals, buy in bulk whenever you can and don’t be afraid to try generic. And coupons are fine but don’t use any coupons unless you would buy the product anyway. And also try to always combine coupons with sales for maximum savings.